What’s the best choice for your next outdoor adventure, a canoe or a kayak? 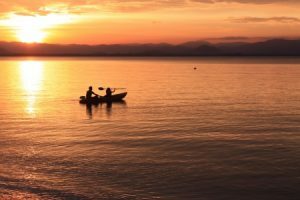 Read on to learn about some of the pros and cons of canoes and kayaks, and discover which one best suits your needs. Canoes have more capacity than a kayak, and are great for long expeditions. They also have more room for kids and dogs. A canoe is typically more comfortable than a kayak, since you have more room to move around, and you can stand up. The higher seating position of a canoe tends to offer better vistas. Ever tried hauling around a canoe? Unless you’re very strong, transporting a kayak is much easier. Kayaks tend to handle whitewater better than canoes. In a kayak, you’re sitting much closer to the water than in a canoe, which is a feeling that some people really enjoy. If you love canoeing or kayaking, come to Mattice Lake Outfitters for abundant fishing opportunities, fun times on the water and a relaxing stay at our fully furnished outpost camps and wilderness lodges. We’re located in breathtaking northwestern Ontario and are a favorite among canoers, kayakers and fishermen. Give us a call today at 1-800-411-0334 to book your stay today!